Every orchid grower knows that there are many enemies of your precious plants including a variety of pests and mites. There are many chemical products available that promise to eradicate different types of mites and pests infesting the orchids, but like all chemicals these harsh products often end up harming the plant as well. That is why keen orchid cultivators prefer to look for natural and organic ways of getting rid of these problems. Mites are the most common pests amongst cultured orchids. They thrive in greenhouses and other warm areas like homes which are the best environment for growing orchids. Due to this reason, if you suspect that there are mites plaguing your orchids, then the first thing to do is increase the level of humidity in your growing area. As soon as the humidity level is increased in the growing area, the mites have trouble separating the water from the nutrients and they have to look for food elsewhere. Some other natural ways to control various pests includes the use of ordinary kitchen products. Common rubbing alcohol can be sprayed on 2-3 times a day to get rid of certain soft bodied mites such as aphids, thrips and mealy bugs. Another way to eliminate these types of bugs is to spray a blend of garlic and hot pepper on the plants. You can make a concentrate by blending together 2 bulbs of garlic and 2 hot peppers with water, which can be later added to a gallon of water and sprayed on the plants. For hard shell bugs like scales and spider mites, you can spray the following mixture 2-3 times a day: mix 1 teaspoon of dishwashing liquid and 2 teaspoons of cooking oil and spray it onto the plant where the mites are present. The dishwashing soap breaks down the insects shell and the oil helps to suffocate the bug, leaving your plants mite free. Finally neem oil is considered to be one of the most effective natural insect repellent and fungicide for a variety of pests. You can liberally spray it onto your orchids without worrying about damaging them while enjoying a pest-free orchid garden. Sprinkle some baking soda around your plants as it is poisonous for ants and is sure to keep them away. Mix equal portions of flour and baby powder and sprinkle it in circles around your plants. The ants are sure not to cross the white line. Spray a mixture of half vinegar and half water on your plants and the strong acetic acid in the vinegar will kill ants. Sprinkle some chili powder, cinnamon, black pepper, peppermint or coffee grounds around the greenhouse or the plants, as they all keep the ants away. Instant rice or cream of wheat is also placed around the plants because when the ants eat it and then drink water, the grains increase in size causing the ants to die. Last but not least, you can mix borax powder along with sugar and water and dip them in cotton balls and place them near anthills. The ants will eat the sweet mixture, but the borax powder will kill them. Weeds are another problem you might encounter plaguing your greenhouse floor. It is not easy to get rid of this nuisance by having to pull out entire sections of weeds from the greenhouse floor. Many people recommend spraying the harsh chemical sprays available to kill weeds, but like all other chemical products, these can also be harmful to your carefully grown orchids. That is why the best way to naturally eliminate this problem from your greenhouse is to spray full strength vinegar on the weeds on a daily basis. However, this method is only suitable for weeds on the greenhouse floor or surrounding areas and cannot be applied to those found in your plant pots. Using all natural products and solutions not only ensures that there are no harmful chemicals affecting your preciously grown orchids but are also safe for the grower to be around. 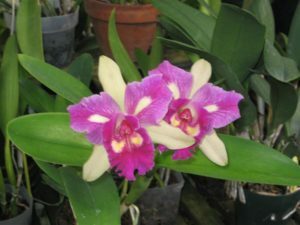 Mary Ann Berdak is the publisher of OrchidCareZone.com an online destination for orchid growing tips and advice. For more information on orchid care download her free report, “The 5 Biggest Orchid Mistakes (and How to Avoid Them! ), at OrchidSecretsRevealed.com. You might want to take a look at these articles that we’ve published on pest control.